Description: Escape from the realm of the dead is impossible when someone there wants you back. Seventeen-year-old Pierce Oliviera isn’t dead. Not this time. But she is being held against her will in the dim, twilit world between heaven and hell, where the spirits of the deceased wait before embarking upon their final journey. "Sorry," Kayla said. But she didn't look sorry. "Impulse control issues. Why do you think I'm in New Pathways for, anyway? Be happy I didn't hit you in the head with a fire extinguisher." "But I get it. People have always been desperate for stories that explain why bad things happen to good people, myths with happy endings to give them hope. They don't want to know that when we die, what lies beyond may not be all harps and halos." "This is certainly better than world history, which is where I'd be sitting if I were back in Isla Huesos right now." If school hadn't been canceled due to the giant hurricane bearing down on the island, anyway." I love Greek mythology retellings, especially the various Hades and Persephone versions that have been so popular in the YA market the past year. 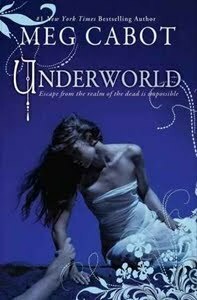 ABANDON by Meg Cabot was one of my favorites so I was eager to see where she took her reimagining in the sequel, UNDERWORLD. And to be honest, I enjoyed this one even more than the first.